Reviews are trickling in from last night’s opening of the Salzburg Easter Festival. There were roars of acclaim for Christiam Thielemann and the Dresden Staatskapelle, which the Salzburg crowd now rate above Berlin. Huge ovations, too, for Georg Zeppenfeld as Sachs, Klaus Florian Vogt as Stolzing and Adrian Eröd as Beckmesser, slightly more subdued for the American soprano Jacquelyn Wagner as Eva. Salzburg first-nighters hate new productions. The director Jens-Daniel Herzog was noisily booed. Well, boos for Herzog were absolutely nothing special for a German speaking country. Quite the opposite, not that many at all. On the other side when one reads the review, one clearly sees that the author has completely missed the point of the staging, i.e. didn’t quite understand it. (And he’s not the only one). This might be a the problem of the staging that the idea does not come across easily, but staging is actually quite clever. Meistersinger are something like KS and/or a Board of a Theater (or opera house) while Sachs is Director/intendant. They decide to check the relevance of theater/opera in modern society and take it outdoors to the people to something like a Volksfestival. (Basically the same what meistersingers do). Outcome is actually quite clever. People don’t go to the opera, like to listen to pop, but love Three Tenors and Co, however please don’t touch the classics, they are great and we don’t want anything new. Outcome – Walther and Eva run away. I carefully checked the sources, but strangely enough, nothing like this is indicated in the score. I was there yesterday and basically agree with the critic. Eva was below the standards of the Festival. Pity that the original singer – Kühmeier – was removed from the cast. All the others where very good. Regarding the production, the less we say the better. It is possible to have modern ones with a clear sense of purpose – look at the current Bayreuth production, which so far I only knew from a DVD but hope to see next Summer. This thing was a mess. I liked Thielemann more than some friends, who wanted more power from the orchestra, but the balance with singers was ideal. Well if balance is enough we are far down….from the golden days of opera! Why he has a career at all is a great mystery to me. Even the part of David would be a stretch for him. He could join the chorus though. 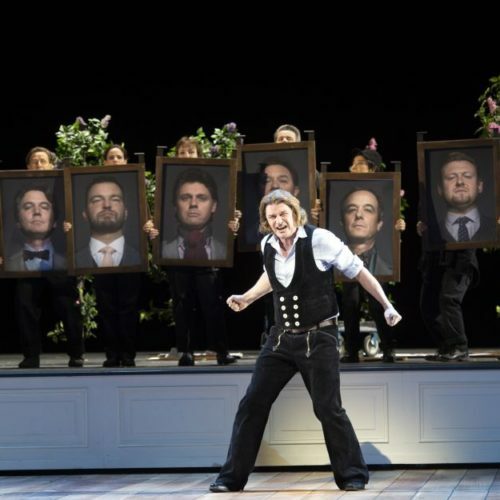 Zeppenfeld is a major talent and a mainstay at Bayreuth. Wish the Met used his services. The singing as a whole was under powered. Thielemann’s usual ‘hand over the mouth’ gesture to get everyone to quieten down in the pit was deployed regularly to balance the sound – which he did – but at a price. He’s usually pretty respectful of not drowning out whoever is on stage – although with certain singers you wish he’d make an exception. And certain seats in the Festspielhaus are acoustically dead anyway in terms of the orchestra appearing quiet. Zeppenfeld acted the role convincingly – he was a solid, but not a great Sachs – and agree with AngloGerman’s comments on Vogt. Adrian Erod’s comic turn as Beckmesser was the highlight on stage. There were far fewer boos for the production than is usual at Salzburg – the reaction was quite tame compared to recent blood lettings. So – yes – Thielemann could let rip majestically in the Act 1 Prelude – which ought to have hinted at the problems he had with balance later on – and then it was, frustratingly, a familiar Salzburg story with the conductor and orchestra outperforming everyone else. Let’s hope for better next year when Harteros returns. There was not a single boo for the director.